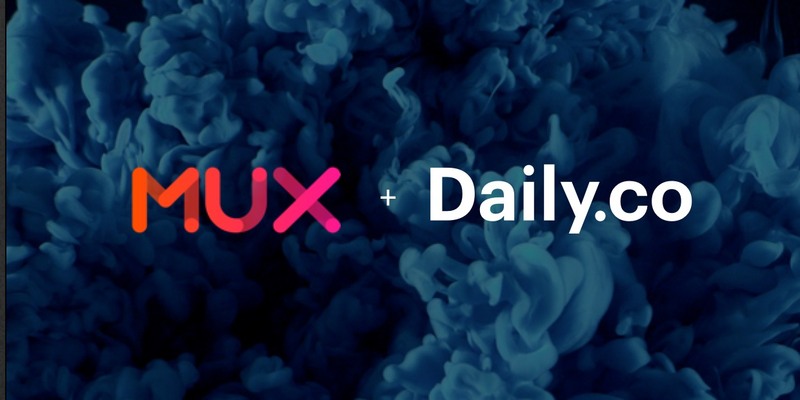 At [Daily.co](http://daily.co) we use [Webflow](https://webflow.com/) for our product website and our blog. 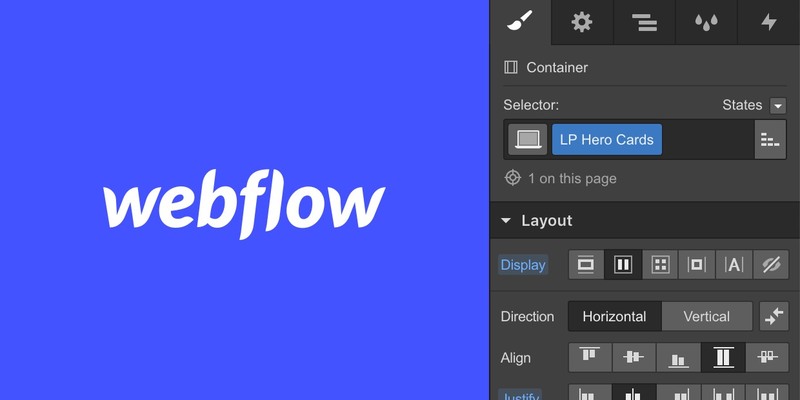 We love Webflow. It's a tool with a big sweet spot. It's easy to use, flexible, powerful, and "just works." 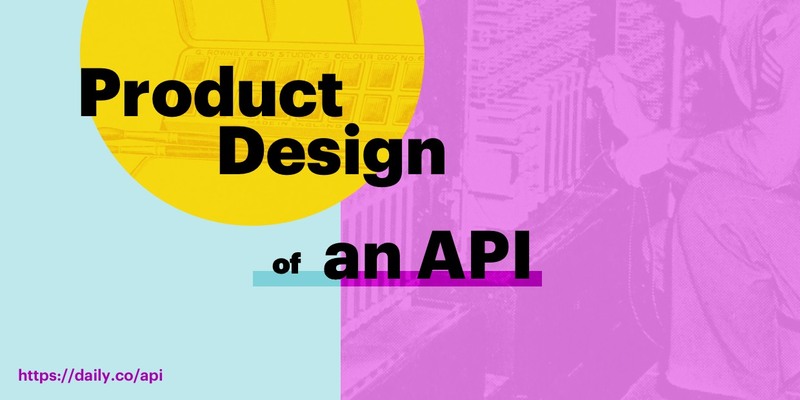 Webflow has almost everything we could ever want in a web publishing and management tool, and whenever we've run up against the edges of the Webflow feature set it's been easy to add a little bit of custom code. 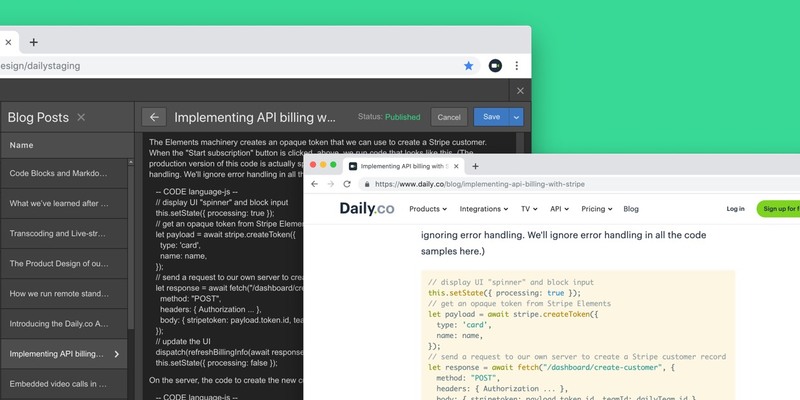 Recently, we started publishing more blog posts that include [code samples](https://www.daily.co/blog/implementing-api-billing-with-stripe), and realized that Webflow doesn't directly support code blocks and syntax highlighting in their [Content Management System](https://webflow.com/cms). So we added that feature! While we were at it, we hacked together markdown rendering support, too. Here's how we did it. However, for blog posts that have sample code embedded in them, it's really nice to format that code with syntax highlighting. We tried a few ways to do that using CSS, but didn't come up with styling that was quite what we wanted. Enter [Prism](https://prismjs.com/), a syntax highlighting library, and [Postscribe](https://github.com/krux/postscribe), a small library that streamlines DOM rewrites. There are just a couple of subtleties here. First, Webflow loads jquery by default, so we didn't need to explicitly load jquery in our template's `<head>`. Second, we're using Prism's [unescaped markup plugin](https://prismjs.com/plugins/unescaped-markup/) to format code blocks of type `language-markup`. The `if` statement in line 15 determines whether we rewrite the DOM to replace paragraphs with nested `<pre><code>` tags (as is generally the case for Prism), or with `<script>` tags (for unescaped markup). Here's a [demo on repl.it](https://repl.it/@kwindla/webflow-code-highlighting) of the above code. So we took the same approach — client-side formatting of parts of the DOM — and added markdown support to our blog workflow. First, in Webflow, we added another text content area to our CMS template. The idea is that if we are authoring a blog post, we can do it as rich text, or as markdown. We use the [Showdown markdown converter](https://github.com/showdownjs/showdown) to turn markdown into HTML. We load it in our document `<head>` just like we load Prism and Postscribe. 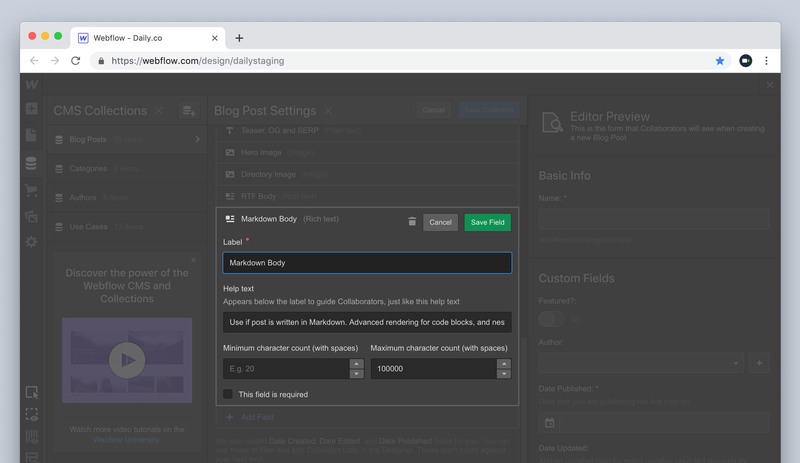 The markdown content area in the Webflow CMS editor outputs HTML. (It's a rich text field, from Webflow's perspective.) 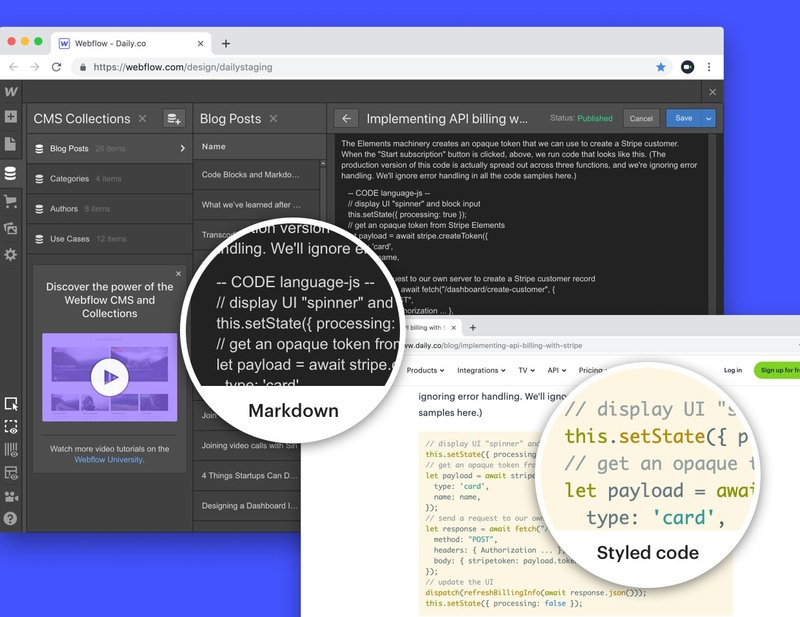 So in our client-side code we convert from the RTF/HTML generated by Webflow to bare markdown, and then from there Showdown coverts that markdown back to HTML! It turns out that the markdown support we added to our Webflow CMS template makes it easy for us to collaboratively edit draft posts in [Notion](https://www.notion.so/product). We do more and more of our product planning in Notion, so it's natural for us to draft code-heavy tutorial blog posts in the same tool. To transfer content from Notion to Webflow, we just "select all" twice in Notion to select all of the blocks of content on a page. Then in Webflow, we "paste as plain text" into the markdown content block. That's it! So easy. The only things that don't work automagically are images. We still have to add images into the Webflow post by hand. But when [Notion launches an API](https://www.notion.so/Notion-for-Teams-f6f02f30e70c4fcdbad04760354d8f79#87a26ecd7fe44733aa1e4c4f88969a02), we'll probably be able to automate those, too! We hope this has been a useful show-and-tell about how we extended Webflow's CMS for our workflows and particular blogging needs. If anything's not clear, or you have any suggestions for how to improve on what we've done, please tweet to us at [@trydaily](https://twitter.com/trydaily). Kwindla, our cofounder/CEO, got started in programming designing tools for kids to learn coding. 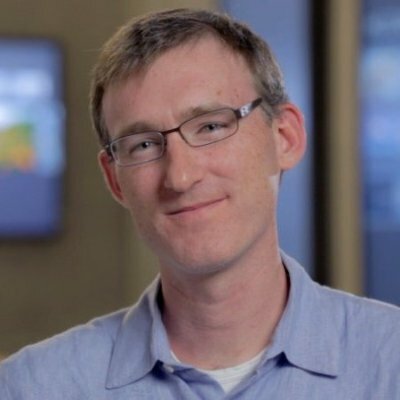 That grew into explorations of collaboration systems; he's been designing and building video calling for more than a decade now.